Twin Speak:DressCode: Shoes, Architecture. Architecture, Shoes. J.M. 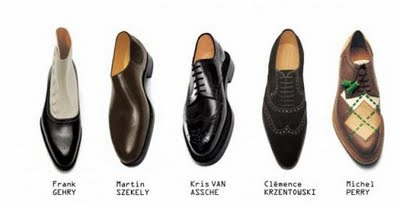 Weston shoes have been made in Limoges, France since 1891. The shoes are handled between 150 and 190 times in order to reproduce exactly the original techniques and craftsmanship of the founder, Eugene Blanchard. The company invited architect Frank Gehry, Dior Homme creative director Kris van Assche, shoe designer Michael Perry, industrial designer Martin Szekely and gallerist Clemence Krzentowski to design shoes for fall '09. 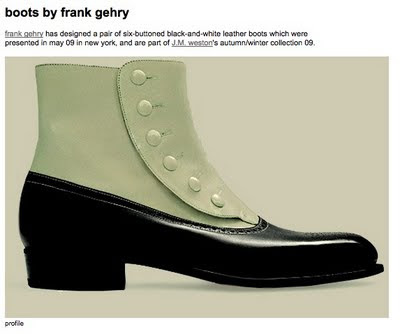 Gehry's shoe is described as "The encounter of a 19th century dandy and a 60s mod." You may remember our reference to Frank Gehry as the designer of Tiffany earrings worn by tennis player Maria Sharapova at the U.S. Open.